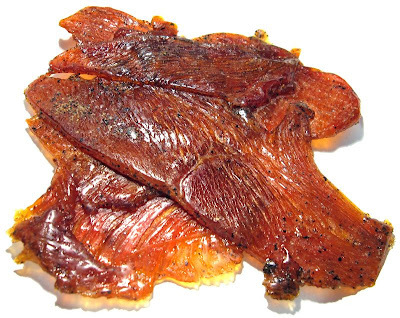 Next up in the series on Mahogany Smoked Meats is this Sweet & Spicy Turkey Jerky. See my previous reviews of their Habanero beef jerky, and Western Strips beef jerky. Turkey breast, water, brown sugar, honey, seasonings (salt, sugar, garlic, black pepper), soy sauce, pineapple juice, cayenne pepper, tabasco sauce, black pepper, liquid smoke, garlic powder, white pepper. The first thing I taste from the surface of these pieces is a lot of sweetness, followed by a spicy tingle, and some black pepper flavor. With some sucking, I can get some saltiness, and even a hint of that pineapple juice. Overall, a moderate to high surface flavor intensity. The chewing flavor starts with some light natural meat flavors, more black pepper, and a light amount of heat. I can also detect a little bit of garlic. For being dubbed "Sweet & Spicy", I think this fits the bill quite well. It has a moderate to heavy sweetness, along with a sticky surface, and a good deal of spiciness coming from the black pepper and a light amount of heat, perhaps from the tabasco sauce or cayenne. There's a light bit of garlic flavor that sits in the background too. But if I had to pick a flavor component that stands out above all others, it would be the sweet. I think that represents this jerky for the most part. The black pepper, however, is quite noticeable and would take honors as the second-most dominant flavor. The natural meat flavors are light overall. I can identify them without much effort, but if you were snacking on this while watching television, or driving down the road, where your attention is focused on something else, you wouldn't notice it. I don't taste much smokiness in this, considering it's sold under the brand "Mahogany Smoked Meats"
The tabasco sauce and cayenne are not easily recognized also, but I can identify them when I think think carefully about what I'm tasting. They do have a nice effect on the flavor, increasing the spiciness. They create a light amount of heat too. I'd rate it on my hot scale as a mild-medium on a single piece basis, but progressing to medium after several pieces. Overall, what you're going to taste in this is a lot of sweet, a good deal of black pepper, a light bit of garlic, a touch of turkey meat flavor, and a fair amount of heat. 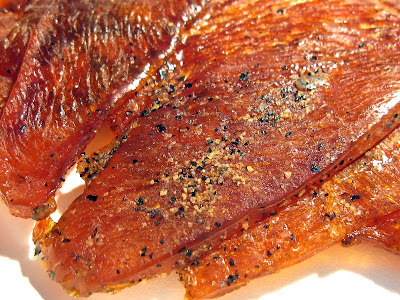 This is a dry jerky, with a sticky sweet coating that makes it feel moist. These pieces are very flexible. I found them easy to tear apart with my fingers, and easy to chew. The chewing texture starts out feeling like rubber, with some chewing resistance. Just a little bit of sucking and biting makes the meat grains separate and break down easily. In just short time, it chews down to a soft mass. At that point, it feels mostly mushy, not really much like real turkey meat. Some of the thicker pieces tend to chew crumbly. In terms of fat, most pieces have some small bits around the edges, but I didn't feel they spoiled the experience. I also found most pieces to contain a streak of gristle down the middle, that created a chewiness when eaten. The sweet coating on these pieces leaves a layer of stickiness on my fingers along with bits of black pepper. Some of this residue is considerable enough that I have to lick them clean and wipe them on my jeans before touching the keyboard. Meadow Farms Country Smokehouse sells this turkey jerky from its website at a price of $8.95 for a 4oz package. I bought three packages, each a different flavor. Add to that shipping fees of $7.95, and it came to a total of $34.80. That works out to a price of $2.90 per ounce. For general jerky snacking purposes, at the $2.90 per ounce price, it's a fair value. I'm getting a lot of snackability for its good overall flavor, though the meat consistency and chewing texture is not as good. But that $2.90 price per ounce is a lot higher than the mass-market brands found in the grocery store, and while this tastes much better, the meat consistency and chewing is not. As a Sweet & Spicy Turkey Jerky, at the $2.90 price per ounce, it's decent value. I did get a a lot of sweet and spicy flavor, and a pretty good flavor at that, and I did get some light natural turkey meat flavor, but the chewing texture doesn't at all feel like turkey. This has more value for being sweet and spicy, than it does for being a turkey jerky. 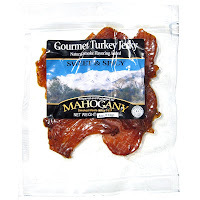 This Sweet & Spicy Turkey Jerky from Mahogany Smoked Meats offers a pretty good flavor, and lives up pretty well as a sweet and spicy variety of jerky. I got a lot of sweetness, and a good deal of spiciness. The spiciness comes mostly from the black pepper, but there's some chile pepper heat coming from a combination of cayenne and tabasco sauce. And there's a light garlic flavor that sits in the background. But as a turkey jerky, I didn't really get much natural turkey meat flavor, and this stuff certainly doesn't feel like turkey meat when chewing. It was more mushy than anything else, which was likely due to the heavy sweet coating. I think this jerky will please those looking for a good Sweet & Spicy jerky, not necessarily those looking for turkey jerky. Otherwise, I still found the overall flavor very snackable, and could definitely eat more of this stuff. My recommended beer pairing for this, try a pale ale, or cream ale.